Planes, Trains, and Automobiles. Paramount Pictures 1987. I saw a little of this movie over a year ago, but I mainly remember a rant Steve Martin delivers. 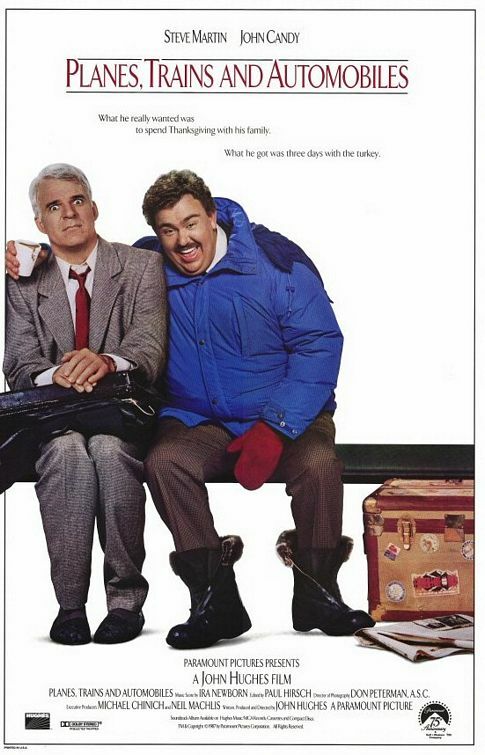 I certainly don’t remember as much in general as a DVD blurb could tell me, but essentially Steve Martin has to cross the country with planes snowed out, and faces a million irritations, many from John Candy, a traveler going the same way. Maybe I do know as much as the blurb after all. Neal Page works in New York, but he’s going home to Chicago to spend Thanksgiving with his family. Except he can barely get a cab to the airport. And his flight is delayed. And rerouted to Witchita due to snowstorm. He has a day to get home in time, by any and every means necessary, and through it all, annoying him, getting in his way, causing most of his problems but also providing most of his opportunities, is Del Griffith, shower curtain ring salesman. This is the kind of comedy that piles misery on top of misery for humor’s sake, but for once I don’t feel too badly about it. The jokes are written and delivered in such a way to take the hurt out of it, and metered so that you don’t get too much time to linger on the full implications of what just happened. At the same time, there are moments when the emotion is a focus, but it’s not too big or broad, just a moment of humanity. In all honesty, it doesn’t take much for a film to get me to tear up, but the emotion in the story wasn’t strong enough to moisten my eyes. Another point on the balance in writing is that, most basically, this film is a series of comic pieces. A race to catch a cab, two strangers sharing a room and a bed in a hotel room, late night driving accidentally on the wrong side of the highway, and so on. But while all these individual scenes that could stand alone as sketches are going on, the characters’ friendship is visibly growing, and backstories are being hinted at. A plot grows underneath the jokes. It seems to me like this is a really rare “Thanksgiving movie”. If it were made today, it’d probably be shoehorned into the glut of Christmas films, and it absolutely doesn’t need to be. What’s important is that Neal and Del are traveling, and “holiday” closings and inclement weather slow them down. Watch this movie: and watch a dozen plausible “worst trip ever” stories pile on top of each other. Don’t watch this movie: with the kids. It’s deceptively close to being a family film.